Some changes this week- Lela, our produce manager has moved on from the Coop. Be on the lookout for a new face at the store! I’ll let everyone know when we have someone to introduce you to. Many thanks to our volunteers that came in to help with our UPC project last week: Sue Shaw and Jackie Pope! We hope to see more volunteer faces around the Coop soon as we continue our project in preparation for a shiny new register system. Have you seen the new discount shelf? We have some amazing deals on a special new shelf in the store. Ask a clerk for details! -A variety of lovely veggies from Moondance including tasty carrots with green tops, cherry tomatoes, cauliflower, fresh onions, and pickling cucumbers! -Mesclun Mix is back in stock from Willowood Farm! Back by popular demand and always a great choice for your summer salads. -We’re still in an abundance of donut peaches from Smallwood Farms AND we have the round peaches back too! I heard there are some folks ready to make pie, and we have you covered. -Artichokes are here! We have new baby artichokes from Crow’s Farm, these little beauties will be great in a variety of dishes. 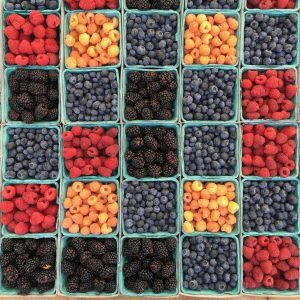 -Berries are still in full force with sweet and tart varieties from Mt. Erie Gardens, Hayton and Skagit Sun. -Thinking about a summer caprese salad? Fresh basil is the key ingredient! We have some super fresh bunches right now from Mt. Erie Gardens. -Cheese, cheese and more cheese is here too! New chive & onion cheddar and sundried tomato & basil cheddar just arrived today from Golden Glen creamery. And if you haven’t tried their “squeaky” cheese curds yet, you’re missing out! I hope everyone has a fantastic rest of the week and we’ll see you soon at the Coop!